The Victorian period saw great technological advances in all aspects of social life. Cooking was a long, slow process and any gadget that saved time was seen as advantageous. Adverts such as these were aimed at the middle classes who would, for the first time have had some disposable income to spend on things they wanted rather than they needed. 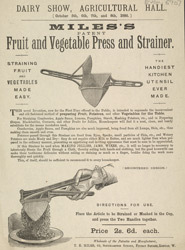 It is also clear from this advert that vegetables were an essential part of the diet of the time.